As we all know, social media is here to stay. Can you name someone who hasn't used it in one way or another? These computer-mediated tools are simply incredible. They allow people to create, share or exchange information, in addition to pictures or videos in virtual communities and networks. They depend on mobile and web-based technologies and include blogs, forums, networks, and many other on line sites and services. The main idea behind social media is that people around the world can easily and instantly share information and ideas through social interaction. In today's world, social media has become an important part of society, mostly because of easy access to the Internet and an ample availability of devices that allow users to surf the web and use a wide range of other services to share information. Sites such as Facebook, Twitter, LinkedIn, and Google+ help people keep in touch with family, friends and work contacts. Social Networking sites can be a great tool for work or pleasure. Great, so how can we show our students the benefits of using social media and incorporate them into our classroom? With Facebook you can share all kinds of information with others. You can also control how much information you want to share and with whom. So,with this in mind, students can practice posting information on their wall. They should be aware of how they are communicating their information, so you can focus on that. They can also practice commenting on things posted by other classmates. Another great activity for Facebook users is to practice chatting. Many people specially students use Facebook chat for group discussions, while some businesses use it for short meetings. It is a useful tool and fun to incorporate into the classroom. Again students can practice this with each other. You can start a conversation and everyone can jump in. When you are done you can make corrections or suggestions. Through Facebook Ads and Fan pages people can advertise their business. Facebook Ads allow us to target people of specific age, geographic location, interests, etc, making our ads effective. This is an amazing tool for those who own businesses. Students can also practice posting ads and information about products and following up on them as well. Twitter is yet another great tool used for social networking. You can use Twitter for a variety of interesting activities. One option is to ask students to record their reactions and opinions to movies they've watched and books they've read. Other students can also give their views and exchange opinions. They can also post their own responses to posts on views about different current issues and open up intelligent discussions with one another. High school students who need to start thinking about their career options before going away to college can benefit from real-world discussions with professionals in careers they’re considering. It is an incredible alternative to connect and facilitate communication. 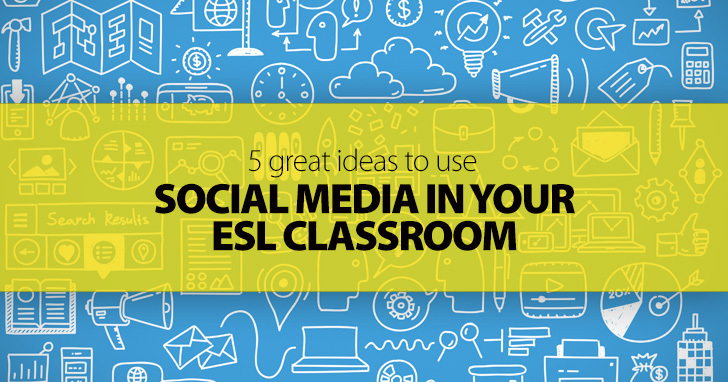 LinkedIn is one of the most powerful professional networking sites available and there is a lot you can do to help your ESL students take advantage of it. Have them create a profile on LinkedIn. This is great because they would practice describing what they do and what their skills are. They can practice showcasing their brand on LinkedIn. This might also require describing products and or services. Finding networking connections and locating job opportunities are also great activities to incorporate when using LinkedIn. Students could also practice a job interview based on the information on their profile. Google plus allows users to post photos and status updates to the stream or interest based communities. They can also group different types of relationships (rather than simply "friends") into Circles. Instant messaging, text and video chats called Hangouts are great ways to get in touch with others. Create a hangout for your class and host a discussion on any topic of interest to them. You can bring up different issues and they can practice giving their opinions. Have your students find something of interest to them that they can share on Google Plus. Blogs have been around for a while now. They are a great option to practice writing. Students can improve their writing skills and learn to express themselves and communicate through their blog. Other students can provide opinions and share their ideas. Create a free blog on Wordpress and have each student take turns writing a blog entry. Though doing this on line is always an option, it is n not a requirement you can also do this on paper and correct it when everyone is done. As we have learned above, these are amazing tools to communicate and share information with others. Students can learn to chat with others, share their ideas, ask questions, comment on people’s status, add their status, make friends, market their business, advertise and much more. Though many are against using these tools in the classroom, it might make more sense to simply embrace them. Try to minimize the negative aspects and teach your students new ways to become connected learners that have the skills to become successful in many other ways as well. How Do I Find Private ESL Students?